Coventry City striker Jacob Murphy says a few chats about the art of finishing with the club's goalkeeping coach Steve Ogrizovic helped him notch his first-ever senior hat-trick. The 20-year-old's 10-minute treble in Saturday's 4-1 win over Gillingham took Coventry to the top of League One. "I had a long conversation with Oggy about finishing one-v-ones," Murphy told BBC Coventry and Warwickshire. "As a goalkeeper, he always knows what other keepers don't like so it's good." Murphy, who is with the Sky Blues on a season-long loan from Premier League Norwich City, has now scored six times in his last three games. And after going round Gillingham keeper Stuart Nelson twice at the Ricoh Arena, Murphy said he is doing his best to carry out what 58-year-old Ogrizovic - who played over 600 games for the Sky Blues in a 16-years at the club - has been telling him in training. 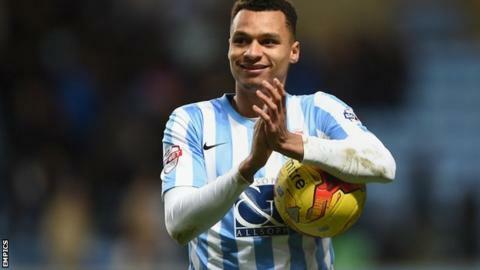 Jacob Murphy's hat-trick was the first by a Coventry player since Freddie Eastwood bagged all the goals in a 3-2 win over Peterborough in December 2009. It is the first time the Sky Blues have led any division since going top of Football League Division One (now the Championship) in October 2001. "We're always doing a lot of finishing and Oggy saw what good positions we were getting into," Murphy added. "He always says it's best to go round the goalkeeper and three times (in the last two games) it's worked. "The first was a nightmare - I had nearly half the pitch to run and think about what I was doing. "I was relieved when the third one went in because I scuffed it!" Coventry's emphatic win took them three points clear at the top of the table and Murphy knows they sent out a bit of a statement to the rest of League One. "We put a marker down and we're showing people we're going to be right up there this season," he said. "We've got a really good team here and we've just got to keep pushing towards that goal of promotion."